Brooklyn Point, Extell’s first outer-borough tower rising at 138 Willoughby Street officially topped out this week at 720 feet, and the views from near the top are even more incredible than expected. The 68-story high-rise designed by Kohn Pedersen Fox will contain 458 luxury units, ranging from studios to three-bedrooms, starting at $850,000 and reaching over $4 million. On track to be completed by 2020, it’ll be Brooklyn’s tallest building (at least until the 1,000-foot building planned for 9 DeKalb Avenue rises) and boast the highest outdoor infinity pool in the western hemisphere. Understudy; image credit: Liz Clayman. 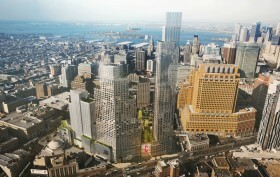 Downtown Brooklyn’s City Point is pulling out all the stops to boost its cool factor. The 1.8-million-square-foot mixed-use development at 445 Albee Square West is already home to the subterranean food mecca known as Dekalb Market Hall as well as the popular dine-in cinema-slash-supper-club Alamo Drafthouse. 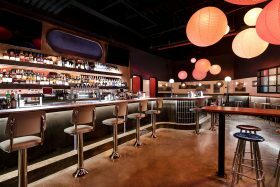 City Point recently announced the additions of a speakeasy-style cocktail bar called Understudy within the food court and Dekalb Stage, a 7,500-square-foot events and live entertainment space just next door. McNally Jackson bookstore on Prince Street. Image by Carl Mikoy via Flickr. Bad news took a U-turn at the start of this year when beloved independent bookstore McNally Jackson announced that it would not be closing its doors on Prince Street in Soho after all. The news came a few months after after owner Sarah McNally, who opened the store in 2004, announced the store would be moving out of the neighborhood due to a 136 percent rent increase (from $350,000 to $850,000). 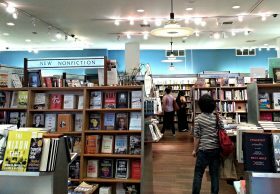 The flagship location of the bookstore is not merely staying open; it will be launching new branches in Williamsburg and Laguardia Airport, and as New York Magazine reports, is on an expansion binge of sorts with stores planned for South Street Seaport and Downtown Brooklyn‘s new City Point complex. 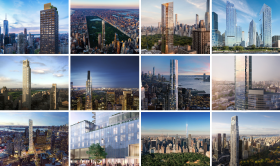 It’s no surprise that the supertall savants at Extell–who are currently constructing the 1,550-foot Central Park Tower as the world’s tallest residential building–used their first foray into Brooklyn to smash yet another sky-high record. The Post reports that the developer’s City Point tower, dubbed Brooklyn Point, will boast the highest rooftop pool in the entire city. 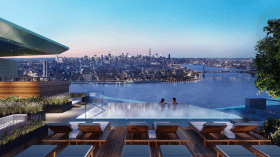 Sitting at the top of the 720-foot luxury condo at 138 Willoughby Street, it will be a 27-foot-long saltwater infinity pool, complete with a full lounge area, a stargazing observatory, and space for outdoor movie screenings. 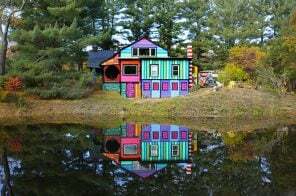 Rental deals have become increasingly tough to find but they’re most definitely still out there. Starting today, every Friday 6sqft is rounding up five of the best deals showcased on CityRealty’s newly launched no-fee rental offers page, where NYC house hunters can find the latest and most generous concessions being offered by landlords across the city. 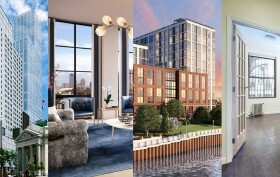 This week, we’ve culled five fabulous buildings in prime Brooklyn that are currently offering FREE RENT on new leases. Among the offers ahead, check out a newly renovated two-bedroom with yard in pretty Carroll Gardens offering a month rent-free on an already reasonable $2,700/month price tag. 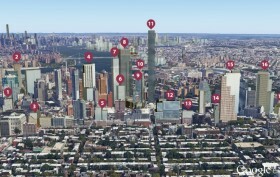 We recently reported that New York City was entering its biggest building boom since 1963. Building permits rose 156 percent over the last year, accounting for 52,618 new residential units. If that number seems large to you, keep in mind it’s spread over the five boroughs, including the supertall towers of Manhattan. But a new report from CityRealty shows that northern Brooklyn alone with get 22,000 new apartments over the next four years. According to the report, which only looked at buildings with 20 or more units, “around 2,700 new units are expected to be delivered in 2015. 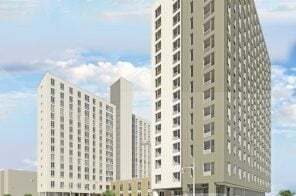 That number will nearly double in 2016, when approximately 5,000 apartments will be ready for occupancy.” The majority of these units, 29 percent or 6,412 apartments, will come to Downtown Brooklyn, followed by Williamsburg with 20 percent or 4,341 units. 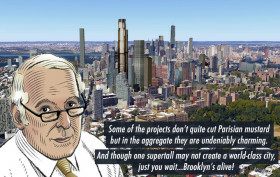 Extell, the development company best known for gobbling up billionaires’ row sites and building supertall towers like One57, is venturing into Brooklyn, a place they’ve long avoided. The New York Times reports that Extell has bought the last development site at City Point, a huge, mixed-use complex in Downtown Brooklyn that will include residential and retail space, and, of course, a massive food hall. Extell will pay $120 million for the city-owned property, on which they will likely build a 500-unit rental building. What’s more noteworthy than Extell’s move into the borough, though, is the fact that the tower could reach 60 stories, according to Extell president Gary Barnett, which would make it the tallest building in Brooklyn. 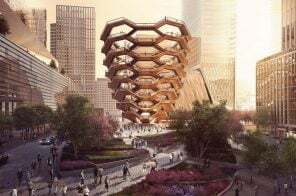 Amongst the city’s more delectable real estate news comes word that the developer of City Point has plans to bring a 26,000-square-foot foodie haven to their massive Downtown Brooklyn project. 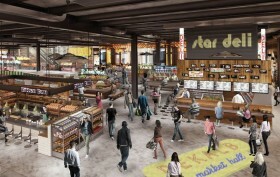 Dubbed the Dekalb Market Hall, the space will host somewhere between 35 and 55 “authentic and locally curated” vendors at the basement level of the 1.8-million-square-foot mixed-use development along Dekalb Avenue. Though leasing is still in the works, more than a handful of food purveyors have already signed on to stir what’s sure to be a culinary revolution for an area more commonly associated with chains like Starbucks and Applebee’s. So yes, put your best sweatpants on, friends, there will be artisanal doughnuts and barbecue.